Photographed along Camp Creek, Maricopa Co., Arizona. 13 Sept. 2008. VINE: Annual, herbaceous vine growing mostly in summer and fall after summer rains. Thin, twining stems. 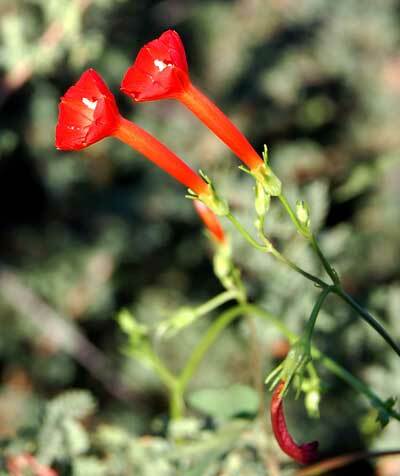 FLOWERS: Scarlet red tubes visited by hummingbirds. Blooming mostly July through September. 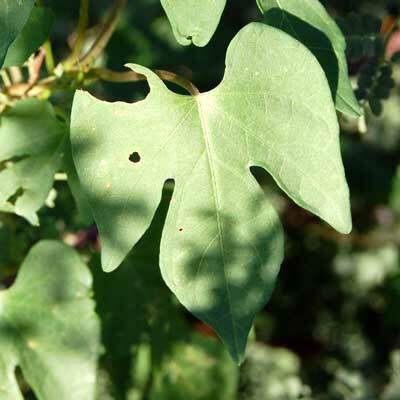 LEAVES: Leaves are heart shaped with 3 to 5 lobes. RANGE: Along the eastern boundary of the Sonoran Desert along mostly riparian washes and canyons. Ranges eastward through Texas. FRUIT: Dry capsules containing usually four large seeds. UNARMED. Without spines or thorns. Copyright Michael J. Plagens, page created 8 Jan. 2009.